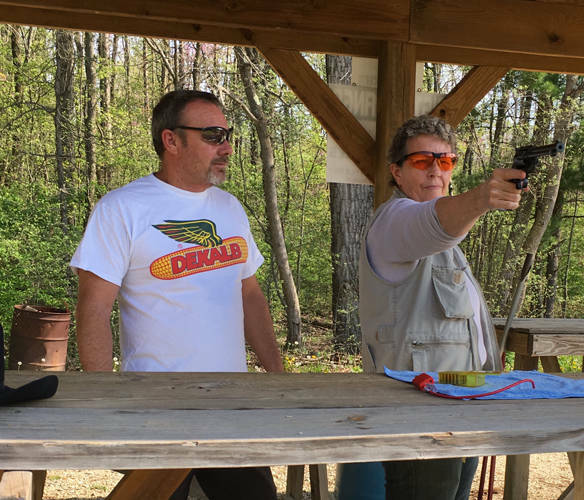 Chris Hunt and Brenda Ballengee are preparing for the upcoming Annie’s Memorial, a class on shooting skills offered by the Annie Oakley Center Foundation and the Darke County Fish and Game Club. Coinciding with Oakley’s birthday weekend, this class in shooting safety is taught by certified instructors. It is geared for the beginner who wants to learn or someone who want a refresher course focusing on safety and marksmanship, loading and unloading, and using gun sights. The class, which does not qualify for the Concealed Carry License, will be held at the Darke County Fish and Game Club located just south of New Madison. A donation of $50 (with $40 for an additional family member) includes the instruction, required eye and ear protection (provided by Fastenal), rifle and handgun, ammunition, lunch and a souvenir T-shirt. In case of rain, a covered firing range will be available. Instruction is from 9 a.m.-noon and firing range time from 1-4 p.m. following lunch. Advanced registration for all ages is required and the class is limited to just 25 participants. Participants must be at least 12 years old and those under age 18 must have a parent or legal guardian present during the entire class. The application and donation must be received by Aug. 1. Applicants after the first 25 will be placed on a waiting list if an opening occurs. For an application, request one at info@annieoakleycenterfoundation.com or by calling Brenda Ballengee at the number below. Lunch for a non-shooting parent/guardian or guest should be pre-ordered for a donation of $8. Extra T-shirts are available for a donation of $10 for anyone interested. Special thanks to the Fish and Game Club, Fastenal and the Ohio Department of Natural Resources for their help with this event. For additional information, contact Bruce Mikesell 937-423-5717 or Brenda Ballengee 937-467-1984.